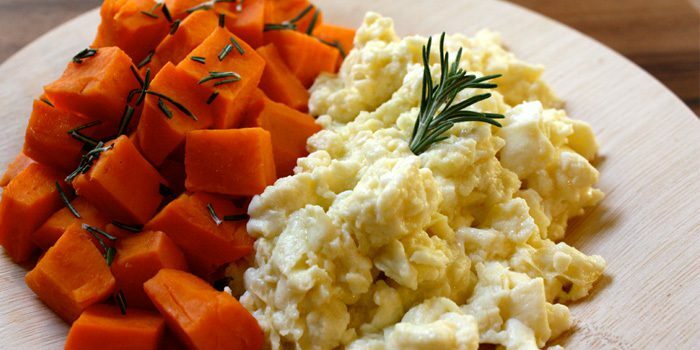 By adding sweet potatoes as a side to your scrambled egg whites in this P90X3-inspired recipe, you add even more nutrients to your breakfast plate. Rosemary add great, fresh flavor. If you don’t have rosemary you can use any fresh herb you like; try thyme, chives, or cilantro. 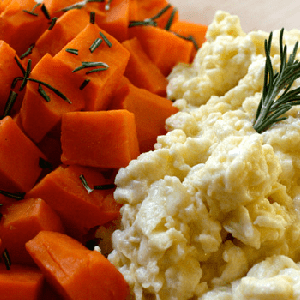 Save time by making this breakfast with leftover roasted or baked sweet potatoes. Or, instead of steaming, you can quickly cook one in a microwave while you prepare the rest of this breakfast. Pierce a sweet potato four to five times with a fork, and microwave it on high for 4 to 5 minutes, or until tender. Peel it and cut into pieces, or slice it in half and scoop out the center. Fill bottom of steamer with 2 inches of water; bring to a boil over high heat. Place sweet potato in top of steamer; steam for 5 to 7 minutes, or until fork-tender. Set aside. Tip: Sweet potato can also be cooked in a microwave. Pierce clean sweet potato 4 to 5 times with a fork. Microwave on high for 4 to 5 minutes, or until tender. Peel and cut into pieces.